Ethiopia has been deemed a population-climate “hotspot” – a place where rapid growth and a changing climate pose grave threats to food security and human well-being. Certainly, the landlocked East African nation faces outsized challenges. One in ten Ethiopians is chronically food insecure, and nearly one in five go hungry in drought years. With almost half its people under the age of 15 and an average fertility rate of nearly five children per woman, Ethiopia’s population is the fifth fastest-growing in the world. And climate change is hitting Ethiopia hard. Increasingly unreliable rainfall is disastrous in a country that depends heavily on rainfed agriculture. The last two decades have seen a sharp upturn in the frequency of droughts in the Horn of Africa, a deadly trend that is likely to worsen. Given these challenges, does continued rapid population growth consign impoverished Ethiopians to chronic hunger? Some, in the spirit of Thomas Robert Malthus, would answer yes. Malthus famously argued in the 19th century that human numbers would inevitably outstrip food supply, because population grows geometrically while food supply can only increase arithmetically. Others, inspired by Ester Boserup, contend the opposite is true: population growth spurs invention that keeps supply ahead of demand. A closer look at Ethiopia shows that neither the Malthusians nor the Boserupians quite get it right. The connections between population and food security are extraordinarily complex. Numbers matter, but so do other dynamics, such as migration and age structure. And context is paramount: the right policies are essential to encouraging – and reaping the benefits from – positive demographic trends, but those policies must be tailored to local circumstances. Ethiopia is a land of stunning contrasts and seemingly contradictory truths. Most Ethiopians live in brutal poverty, their per capita income among the lowest in the world. And yet, Ethiopia is one of the so-called “African lions:” its economy grew at a brisk 7.5 percent last year, more than twice the rate of emerging economies as a whole. Ethiopia is a nation where small farmers struggle to eke out a living on tiny, degraded plots of land: in the densely populated highlands, roughly half the land is significantly eroded. Yet Ethiopia is also the target of aggressive “land grabs.” Since 2008, the government has leased or sold nearly 10 million acres of prime farmland in the less-populated lowlands to investors from China, India, Saudi Arabia, and elsewhere, according to Human Rights Watch. How do we reconcile these contrasts? First, national averages are of limited use in a country like Ethiopia, with its diverse topography and staggering inequities. Geographically, Ethiopia’s regions are as distinct as, say, Arizona and Minnesota – and the outlook for environmental quality and food security vary accordingly. There are also huge disparities between rural and urban Ethiopians. To understand the relationship between population dynamics and food security, then, it is helpful to remember that there are many Ethiopias. It is also helpful to set aside any preconceived notions about population and food. Malthusians argue that population growth inevitably leads to hunger, as the resource “pie” is divided into ever smaller slices. The most obvious flaw in this theory is that technology has thus far allowed the size of the pie to increase. Another is that food and other resources are not distributed equitably; some people get much larger servings than others. The pie as a whole may be big enough for everyone, but only the slices of the poor continue to shrink. The Malthusian narrative doesn’t fit Ethiopia, where the areas with the highest population densities are not usually the hungriest. In The Demographic Transition and Development in Africa: the Unique Case of Ethiopia, Charles Teller found that “high density can either increase vulnerability or strengthen resilience,” depending on a host of other factors, including technology, infrastructure, education, urbanization, and effective implementation of population and development policy. On the other hand, Boserupians would contend that population growth can actually diminish hunger, by forcing societies to modernize agriculture and improve productivity. But realities on the ground in Ethiopia don’t fit that narrative, either. If the Malthusian and Boserupian explanations fall short, what are the root causes of hunger in Ethiopia, and how might they be addressed? Mogues cited several “deep determinants” of hunger, including geography (for example, rugged mountainous terrain and a changing climate) and institutions (a broad term that includes the rule of law, governance, policies, investments and property rights). Many small farmers in Ethiopia lack secure land tenure, for example, which removes incentives to improve the land and discourages them from seeking employment off the farm, lest their land be taken away. The government’s ineffective aid to small farmers and concessions to agribusiness also fall under this heading. In Ethiopia, women in rural areas play a key role in agricultural production, food purchases, non-production activities in the agriculture value chain, and in home preparation of food. Thus, high fertility rates mean that women are less able to devote time to these agricultural activities as they need to allocate more time and resources to child rearing, which has food security implications above and beyond the fact that produced or purchased food will have to be shared with household members in a larger household. Age structures are also important. 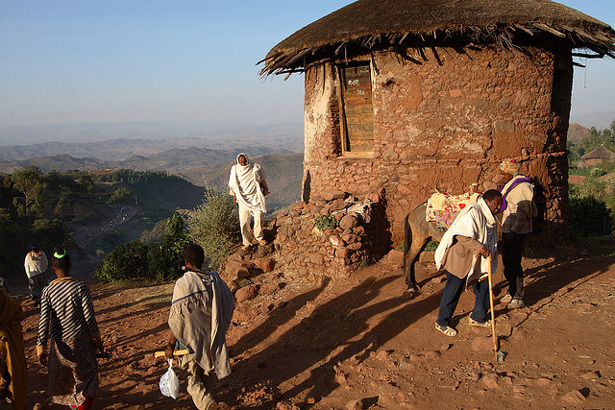 Nearly half of the Ethiopian people are “dependents” – under age 14 or over 65. This high dependency ratio diminishes productivity in agriculture and other sectors, because a lower share of the population is in the workforce. Finally, migration – or the lack of it – plays a role. Government policies aimed at keeping ethnic groups in their home regions suppresses migration to cities and more productive rural lands. Freer migration could reduce pressure on overworked land, allow more appropriate division of labor, and energize development. How can the government and donors address the myriad causes of hunger in Ethiopia? With a “comprehensive approach to food security that includes attention to the full spectrum of population dynamics and geographic distribution,” said Charles Teller in an interview. That means a robust safety net for the most vulnerable, integrated with ongoing programs to bolster nutrition and health. It means flexible migration policies and stronger rural-urban linkages, coupled with better planned urban development. It also means agricultural policies that help small farmers improve their productivity, rather than displacing them. According to Ethiopian development expert Fantu Cheru, those policies can include foreign direct investment, as long as the government negotiates terms of engagement that are transparent and fair. For example, the proceeds from cash crops should be invested in improving production of staple foods through extension services, infrastructure, and better equipment for poor farmers. And it means policies that support – and capture the benefits from – the transition to lower fertility. That demographic transition could improve food security in Ethiopia by freeing up women’s time and lowering the dependency ratio. But the transition is not automatic; it requires supportive policies, such as girls’ education, employment opportunities for women, and enforcement of laws against child marriage. Importantly, it requires access to family planning and reproductive health services. Today, just 27 percent of married Ethiopian women use modern contraception. One in four have an “unmet need” for family planning – they wish to prevent or delay pregnancy but are not using an effective method of contraception. Addressing that unmet need would have important benefits for women and their families, and it could also help fight chronic hunger. In this land of contrasts and contradictions, the causes of food insecurity are numerous and complex. Neither Malthus nor Boserup could fully capture that complexity, but both perspectives offer insight on the limitations of current policy – and help point the way to a less hungry future. Sources: CIA, Central Statistical Agency (Ethiopia), Food and Agriculture Organization, Human Rights Watch, Journal of Peasant Studies, MEASURE DHS, Overseas Development Institute, Population Action International, Population Reference Bureau, Rodrik (2002), Teller (2011), The Economist, The Global Mechanism, UN Population Division, U.S. Geological Survey, United Press International, World Bank. Photo Credit: “Early morning in Lalibela,” courtesy of flickr user Dietmar Temps. I'm puzzled! what drives Laurie Mazur to racism, lie, inferior complex…..
Human rights watch, Oxfam International… always fabricated negative news on Ethiopia. all are the looser!!! A genuinely scientific analysis of the Ethiopian food insecurity problem. Thanks Laurie Mazur. I hope our leaders and the international community will learn from your analysis. Scientific and policy debates should be lively and will almost by definition have different perspectives. This is the kind of discussion we want and expect on NSB. Let's focus comments in these areas for purposes of productively addressing development challenges where ever they occur.